“Iridescent Nation” is a club for Carnival Glass collectors between the ages of 1-18. 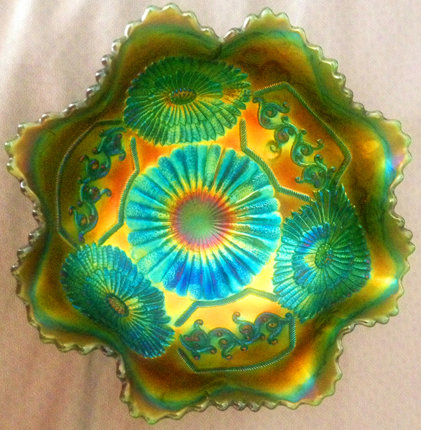 Established in 2003 as the "Sunshine Club," Iridescent Nation helps young collectors discover and learn about Carnival Glass, pressed glass with lustrous, rainbow-like colors (called iridescence). Mission Statement: Iridescent Nation strengthens our Carnival Glass community by nurturing and educating young collectors, celebrating our hobby, and promoting the future of Carnival Glass via a new generation of collectors. Our club founder, Dolores Sage, passed away on July 4, 2018, at the age of 92. Dolores started collecting carnival glass in the 1960’s. Her first piece was a marigold Imperial Star Medallion milk pitcher given to her by her mother. She collected Fenton Dragon and Lotus, Northwood Good Luck, wine and cordial sets, milk pitchers, water pitchers, and creamers. She was a fierce advocate for promoting collecting carnival glass to future generations. In 2002, she came up with the idea of a carnival glass club for young collectors. In 2003 the Sunshine Club was formed as part of the Sunshine State Carnival Glass Association (SSCGA). In 2012 the name was changed to Iridescent Nation and now, 15 years later, it is still going strong with 58 active members ages 18 and under, and more than 200 alumni. We hope you enjoy the video. Please visit the “Member Glass Spotlight” page to see photos of our members' Carnival Glass pieces. Members are encouraged to submit additional photos of their Carnival Glass for the “Member Glass Spotlight” page. Any personally identifiable information (a photo caption with your name or if your photo is of you holding your glass) will require permission from your parents. Please contact the editor for a permission form for your parents to fill out and instructions on how to submit your photos. A BIG THANKS to the Carnival Glass Clubs and individuals who donated glass, books, and dollars to Iridescent Nation in 2018. We appreciate YOU! WHY DONATE to the Iridescent Nation Club? Our biggest cost is mailing. Our club spends $750 on postage and packing peanuts each year to mail 50+ pieces of glass to our members. We also mail a Carnival Glass Encyclopedia and a binder of educational materials to each new member. Your continued support of our club through monetary donations is noteworthy because it means we will not have to raise the $10 membership fee. DONATE HERE and thank you! Membership in Iridescent Nation is just $10.00 (US) per person per year. Club members receive a free piece of glass every year, a quarterly newsletter, and a binder for the newsletters, special forms, articles, and other information that we occasionally send them. Are you looking for a special gift for a young collector? Give them a membership to Iridescent Nation, the gift that keeps on giving! Click here to join! The quarterly newsletter is a benefit of membership. Click here to the see a sample issue of the newsletter and an index of Issues 1-20. An archive of all published issues, beginning with the first issue in March, 2004, is available to members. Article submissions encouraged! Email the newsletter editor. Click here to learn more about carnival glass education and carnival glass clubs in your area.